You might have gathered by now that my household’s been having difficulty keeping up with the incredible egg laying ability of my beautiful girls. This morning I had 26 eggs in the fridge, the oldest ones were only laid six days ago. I date my eggs with a pencil as soon as they come up to the house, something my mother used to do to keep track, and as you can see from the photo below, some of them are quite gigantic! 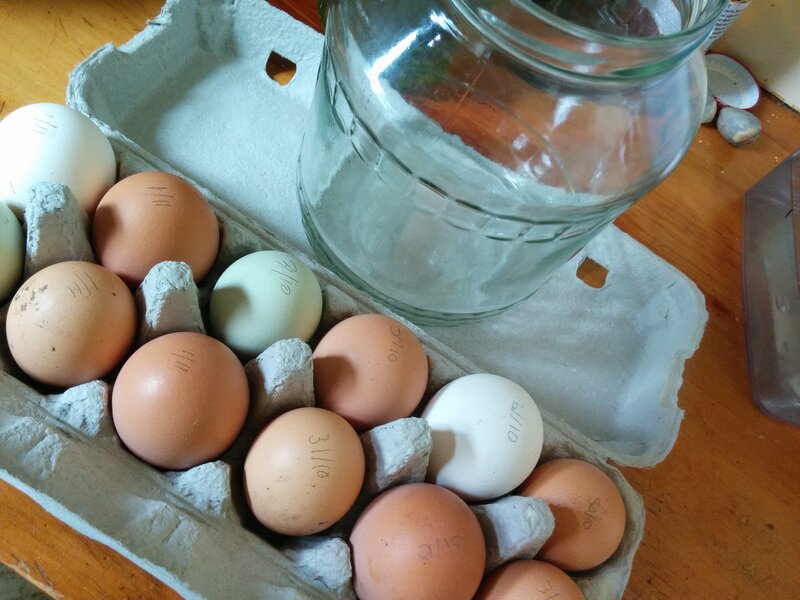 A dozen free range eggs and an old pickle jar, waiting to get together! 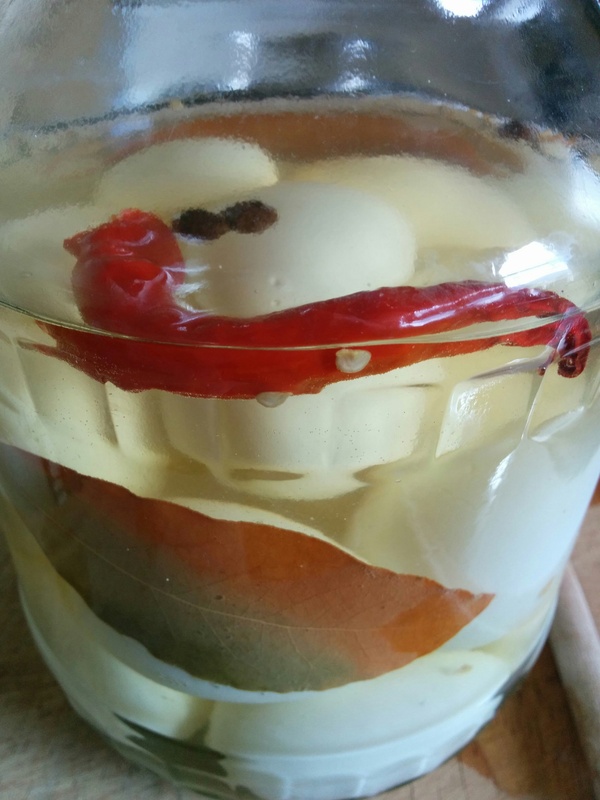 So, I decided to make very old fashioned Pickled Eggs. I haven’t had these since I was a child (yes – that long ago!) when my mother used to make them occasionally when we had a glut. I still have some dried chilies from last year’s crop, so decided to use one in the pickling brew, along with allspice berries and a couple of bay leaves I dried a few years ago from a friend’s tree. The vinegar was mostly home made thanks to a vinegar “mother” my dear friend Sara gave me last year (see yesterday’s post about Sara – she’s pretty wonderful!) and topped up with some shop-bought white vinegar. Older eggs are actually better for hard boiling, as they’re easier to peel, so a few of mine have a few “dents” in them! 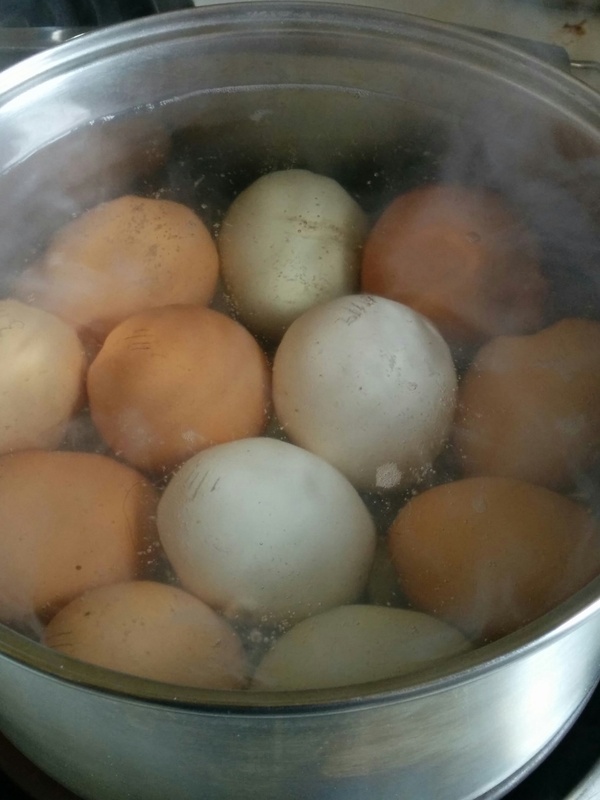 Start by boiling the eggs for 8-10 minutes (you want them really hard for this). Once they’re cooked, plunge into cold water and tap each to stop them cooking any further. Put the clean, wet jar in a low oven to sterilise. In a saucepan, heat the vinegar, stir in the sugar and salt until dissolved with a wooden spoon. Add the allspice, chili and bay leaves and cover, reducing the heat. Simmer for about ten minutes. While it’s simmering, peel the eggs carefully, wash them in cold water to remove any tiny pieces of eggshell and put aside in a bowl. Check the jar, if the water is completely evaporated it’s ready to use. Carefully remove it from the oven and put it on a board, preferably on the stove top next to the simmering pickle (this reduces the risk of spills and accidents). Take the sterilised lid out of the water with tongs and put it on the board to cool. Put the wooden spoon in the jar and roll the eggs in gently. Then, very carefully and slowly pour the hot vinegar and spices over the spoon and make sure the eggs are covered. Put the lid on firmly to create a seal and leave to cool. Label and date your jar and put them in a dark cupboard. They should be ready in 4-6 weeks – I’ll be trying mine on my birthday – and they will keep for up to a year.